We've lived in Texas for almost five months and we STILL haven't tasted some good ol' Texas BBQ... that's the equivalent to living in Paris and not having a baguette. So we made an effort to check out this family owned BBQ joint while we were in the Austin area that's been serving up meats in all shapes and sizes from ribs to jalapeno cheddar sausage and sandwiches to slaw since 1932. 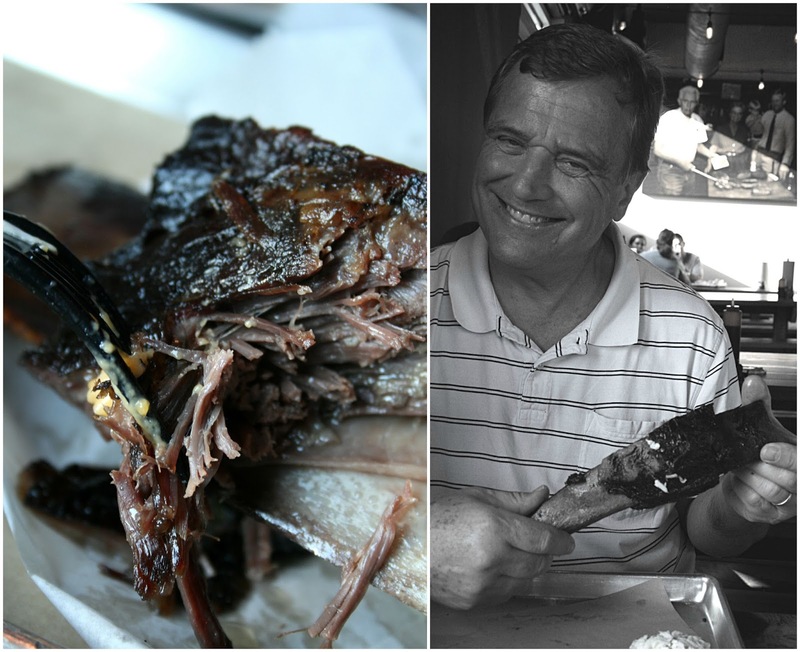 At Black's the tea is sweet, the smells are smokey, and the ribs are the size of a man's forearm. We ordered some Cow ribs with a smoked turkey sandwich, and three pints of sides including baked beans, mac n' cheese, and coleslaw - it was enough to feed a small third world country but you know what they say about Texas! I was surprised at how modern and hip the atmosphere was for a down home BBQ joint, I appreciated that you could witnessed the "behind the scenes" portion of the kitchen and see them smoking, cutting, and seasoning meats. The tables are all arranged family style AND they deliver your foods on a sheet pan covered in wax paper - there's no denying things are gonna get messy up in here! These ribs were no joke, at $17 a pop you're definitely getting your fill of moist, flavorful beefy goodness and considering each rib contains a pound of meat, it's definitely worth the money. The smoked turkey sandwich was on par with the ribs and were moist and flavorful. The sides did not disappoint - the mac and cheese had a great creamy consistency and the coleslaw was sweet and offered a great breakup of flavors with all the heaviness going on, the beans were the least favored, I guess I was expecting the traditional bbq baked beans but these were savory and made with larger, thicker beans (they improved with the addition of bbq sauce).